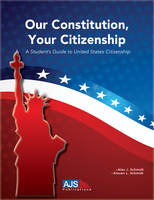 Our Constitution, Your Citizenship - A Student's Guide to United States Citizenship is a concise 56-page worktext to aid in the study of United States citizenship curriculum and testing. The materials are written and designed for students (from middle school to high school to adult education) of all levels and abilities. This worktext is easily incorporated with other civics education and online tools. Give your students more than basic knowledge of American citizenship, give them the insight into the details that shaped our great nation! Our materials are easy-to-read and easy-to-understand, giving students the solid foundation for more in-depth exploration of citizenship and government. This worktext fully supports the Citizenship testing in all 50 states including recent civics programs in Arizona, Florida, Idaho, Kansas, Louisiana, Michigan, Minnesota, Missouri, New Hampshire, North Dakota, South Carolina, South Dakota, Tennessee, Utah, and Wisconsin. Many of the other states are currently evaluating their citizenship curriculum.